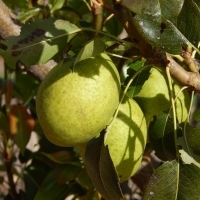 Daleys Fruit Tree has Plants for Sale to Inglestone (qld) and can Mail Order them to you door. Click to Find out how much Freight Will Cost. This is a fantastic little book that simplifies the art of pruning fruit trees. It covers all the deciduous fruits and citrus trees, including peach, nectarine, peacharine, apricot, almond, plum, cherry, apple, pear, nashi, quince, fig, mulberry, persimmon, citrus, grapes, and kiwi fruit. The new revised edition is packed with colour picture and helpful tips. This is an authoritative guide which has established itself as a classic work on fruit growing in Australia for the home and small scale fruit grower. An easy to read enjoyable reference book. 382 pages of information on over 200 fruit and nut trees. Large, golden yellow fruit with a creamy white flesh. Great for fresh eating as the flesh is crisp and sweet. Vigorous tree, resistant to blight. Subtropical variety Chill 350 hours.